geek with curves: Lembas bread. And look! More lembas bread. It's a good Friday night when you have a pal over to make fantasy food. Hopefully that's what will be happening on many of my Friday nights for the near future. For our first venture, Autumn and I decided to make lembas bread. We wanted to take Tolkien's descriptions into account, but we also wanted it to be edible. Sure, it's fun to be authentic, but the thought of making unsweetened, wafer like bread wasn't that appealing. I wanted to look forward to eating what we made. We searched the web for a few recipes. A couple of them included flower water. That might be something elves would do, but I dislike flower water. I also don't care for fruit or nuts in my bread. So, we compromised and found a recipe where you could substitute apple juice for the apples and Autumn thought of a brilliant way to get around adding nuts. 1 3/4 cups of white flour - we used 3.5 cups of all purpose white flour instead of mixing two kinds, keep extra flour on hand for rolling out the dough. It's sticky and you'll need it! 3. Chop butter into mixture with a pastry cutter or knead in with your fingers until you get a crumbly mixture. 4. Add sugar and honey and mix. 5. Add almond milk and apple juice. Stir with a fork or knead with hands until dough forms. The dough will feel really sticky, but that's okay. It works out. 6. Roll the dough out about 1/2 inch thick. 7. Cut out 2-3 inch squares and transfer to an ungreased cookie sheet. Criss-cross each square from corner to corner with a knife. We used a star shaped cookie cutter and folded the points in. 8. Bake for about 12 minutes or until set and lightly golden. Makes about two dozen cakes. The lembas bread tasted like honeyed biscuits. It's soft but not completely chewy, and though they are filling, they have a light and airy texture. It's sweet but not too sweet. One bite is not going to fill your stomach though. I could easily have eaten four of them. You can get the template for the mallorn leaf here. I used paper instead of craft foam, and I'd recommend drawing the leaf a little bigger than the template. I also think the craft foam method described on that site would make the wrapper much sturdier, and then it could also be reused. Lessons for next time: cut the pieces into squares. I think the shape we used made it hard to close the mallorn leaf. I also will not put them on the bottom rack of the oven; a few pieces ended up burnt. Other than those minor issues, the end result was delicious. Next time, I may try a slightly sweetened short bread recipe. Sounds really good, actually. Might have to experiment with this, myself. Be sure to keep us posted on further recipe trials! What is it with people sticking fruit and (especially) nuts in every dang baked item? No such thing is even hinted at in the text, and definitely seems against the spirit of the elven bread. That extended scene where Legolas says something about "one bite can fill the stomach of a grown man all day" or something. 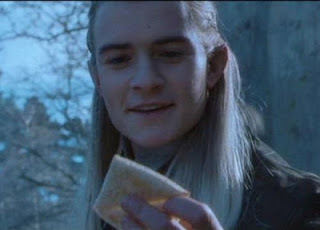 In the commentary track, Orlando said he called that the "Lembas bread commercial". Funny. And as I write this, Dementia Radio (http://dementiaradio.org/) is playing "The Ballad of Bilbo Baggins" sung by Leonard Nimoy. I love making themed recipes! 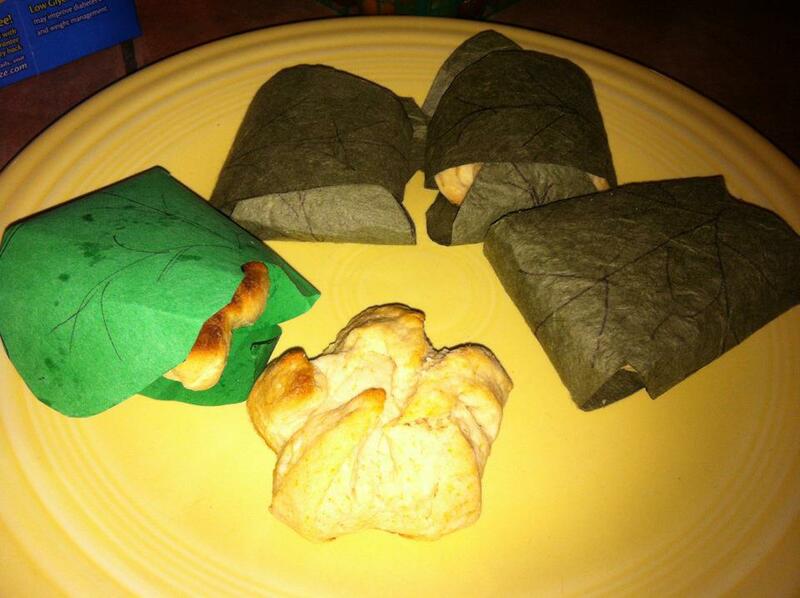 We did an LOTR marathon at the end of last year and I thought about Lembas bread, but we actually did a full meal and doing the Lembas bread as well would have been too time-consuming. Thanks for sharing this! I've always wanted to try making lembas. A suggestion, if I may: How about ground nuts (I recommend almonds, macadamias, and/or pine nuts) in the batter? That would add some body and flavor, as well as helping it live up to its nutritive reputation, without messing up the texture. I once had a friend who added ground macadamias to his waffle batter. Amazing. Also,to wash the stuff down, I would like to call your attention to a wild plant I discovered years ago, monarda fistulosa (commonly known as horsemint). A rather coarse, weedy, unassuming looking flower, it has a wonderful, odd, strangely *wholesome* smell when crushed. It is used as a tea by some of the old timers around here to cure headaches. I've tried it for that, myself, and it does seem to help--sort of clears both the sinuses and the mind. A friend once said it smells and tastes like sunshine. Sound familiar? Athelas with your lembas, anyone? If you can find some, try a tablespoon or so of the dried herb (two tablespoons of the fresh) in a cup of boiling water, sweetened with a bit of honey. Some people don't like the taste, but almost everyone appreciates the smell. Ultimate geek points for serving them together. And nice call on the horsemint.